All new tyres require scrubbing in for approximately 100 miles (although wet conditions will extend this mileage) during which time you should gradually increase lean angles but avoid hard acceleration and braking. In the past the development of tyre and rim technology has led to various rim constructions. Over the years with the application of both theory and experience two basic rim systems have been developed, one for tubeless tyres and the other for tubetype tyres. For tyres which use an inner-tube, that is tubetype tyres, the WM rim is used (fig 1). Next, the MT rim (without illustration) was developed for tubeless tyres then the humped MT H2 rim (fig 2). The hump prevents the tyre from slipping down to the well due to air loss. On today’s market the crossply tyre is the “classic” design. Its advantages are its straightforward structure and its sturdy sidewalls, which particularly in off-road use offer many benefits (impact protection). Crossply tyres have a maximum design speed of up to 240 km/h (150 mph). Material used: usually rayon or nylon fabric. Typical designation: 4.00 – 18 64H TL ContiGo. The breaker tyre originated from the crossply design, to provide a tread area which was effectively reinforced from the inside, giving the tyre a longer service life through reduced transverse slip and making it less prone to failure. Transverse slip originates from the tyre design and results from the lateral deformation of the rolling tyre. Slip always results in wear: the greater the slip, the greater the wear. Although circumferential wear (also known as longitudinal wear) can be substantially reduced through a defensive riding style and also careful acceleration, it cannot be totally avoided, because slip is always needed to transmit the tyre forces to the road. Continental uses this design on its ContiGo and Milestone. This type of tyre has a maximum design speed of 210 km/h (131 mph) in the Conti range. Material used: usually rayon or nylon fabric. Normally the breaker and casing feature the same material. Typical designation: 130/90 – 16 73H TL reinforced Milestone. The bias belted tyre is the precursor of the radial tyre. Whilst the casing is still crossply in design, the tyre features an aditional belt, usually made from Kevlar. Suitable for speeds up to 240 km/h (149 mph). The bias belted tyre can be recognised by the B (=bias belted) in the designation on the outside of the tyre. For example: 150/70 B 17 69Q TL TKC80 Twinduro. Radial tyres feature a casing angle of approx. 90° to the circumferential direction (direction of travel) and a belt angle of 0 – 25° approximately. The belt, located under the tread area, gives the tyre stability and permits far higher speeds, as the centrifugal force deformation is substantially lower. Reduced material thickness in the sidewall section means the tyre heats up less and the high speed strength is further increased. In terms of riding dynamics, modern motorcycles are geared to radial tyres. As an example, a 4.00 – 18 64H TL ContiGo tyre “grows” by approximately 20mm at a constant speed of 210 km/h (130 mph), whereas a comparable radial tyre only expands by a few millimetres. The radial tyre can be recognised by the R in the designation on the outside of the tyre. Motorcycle manufacturers always go into the subject of air pressure in great detail in their vehicle manuals. It is possible to find instruction on air pressure for every driving situation. In addition it is usually possible to find a sticker on the vehicle with the necessary information written on it. The manufacturers make a distinction between load (riding solo or with a pillion passenger, with or without luggage) and speed (on secondary roads or motor-ways). Naturally in such a short fitment guide it is not possible to give the necessary tyre pressure details for every motorbike and because of this we refer you to the recommendations of the motorcycle manufacturers. From years of experience we are aware that motorcyclists sometimes ride on tyres for which the air pressure is not suited to the driving conditions. We do however advise that you always ride at the highest pressure level given in the manual. Some amount of comfort will be lost, but that loss will be outweighed by improved safety. In addition the rolling resistance will be lower which will help to save fuel. 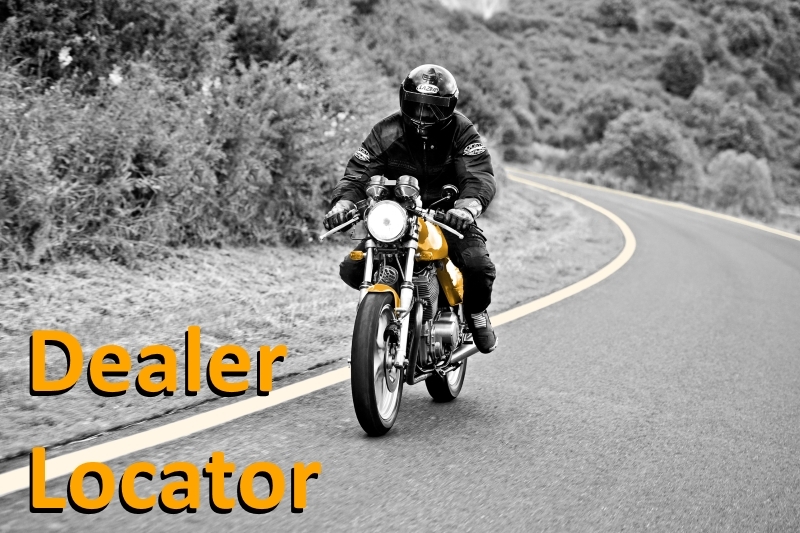 Incorrect inflation pressure reduces the service life and may have a negative influence on the riding characteristics of the motorcycle. Under-inflated tyres flex excessively, easily overheat and can suffer damage. Over-inflation can cause uneven wear. Improper inflation, either too high or too low, can adversely affect overall handling and ride quality. Tyre pressure will be measured when the tyres are cold. During riding the tyre becomes warm and the tyre pressure is there-fore higher (up to 0,5 bar). This excess pressure should not be let off as it will automatically be balanced out as the tyre cools down again. 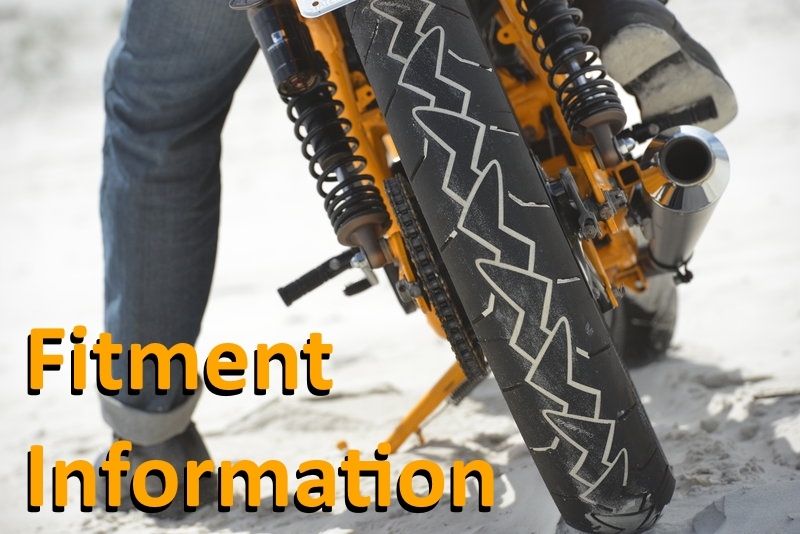 If you possess no tyre pressure recommendations for your motorcycle follow air pressure recommendations shown in the Continental fitment guide. As a rule the tyre pressure for motorway riding should be 0.2 bar higher. The same also applies to a bike with a fully laden rear axle. 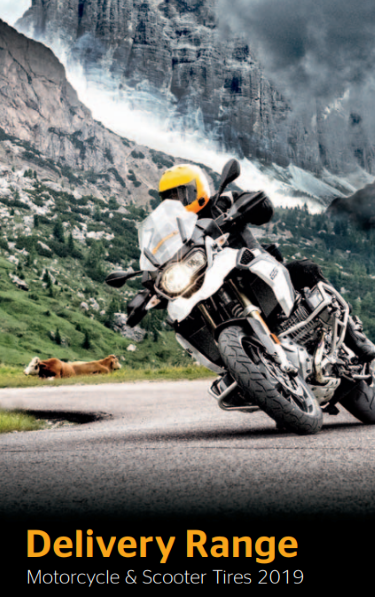 When selecting new Continental motorcycle tyres, be sure they meet the requirements of your motorcycle and its expected usage. For the makes and models not covered by the Continental fitment guide, contact the Continental importer or the motor-cycle manufacturer before tyres are fitted. Never exceed the accessory restrictions and vehicle load capacity found in the motorcycle owners manual or the maximum load moulded on the tyre sidewall. Look at the table for speed ratings (page 80) to find the right tyre for your motorcycle. Continental does not recommend the use of any of its products in excess of legal speed limits. Only specially trained persons should fit tyres. Fitting tyres requires that you lubricate both sides of the tyre bead and rim, all the way around. Use a commercial tyre-bead lubricant not soapy water. Do not use a petroleum-based or silicone-based lubricant. Observe the directional arrow on the sidewall. Do not use sealing liquids. Balancing and tyre service are best performed by your Continental motorcycle tyre dealer who has the equipment and know-how. Ask your dealer to check the concentricity and balance of your tyre/wheel assembly after mounting. Do not use balancing liquids. To prevent tyre damages by touching parts of vehicle sufficient clearance is important under all riding conditions. Continental does not recommend repairing a damaged tyre by simply fitting a new inner-tube. Due to safety reasons Continental recommends to always fit a new tyre instead of repairing it. It is prohibited to regroove motorcycle tyres. Tyres should be stored in a cool, dry and dark environment.